I recently completed reading one of the most stimulating books (1) on the conceptual aspects of evolution that I have read in many years. The author, Peter Godfrey-Smith is a philosopher of biology at Harvard. He has written widely on topics in the philosophy of science and is the author previously of an exceptionally thoughtful introduction (2) to that field. 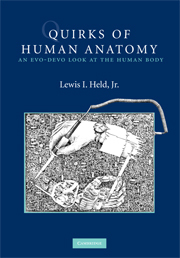 Quirks of Human Anatomy by Lewis Held, Cambridge University Press, 2009. Occasionally, those of us well embedded in science need an outsider, some distance removed from the action, to cast a critical eye at how we operate. A book I highly recommend for any practising scientist to read is ‘Fabulous Science: fact and fiction in the history of scientific discovery’ (Oxford University Press, 2002) by John Waller. The author is a graduate in Modern History from Oxford who went on to take a Masters in Human Biology before specialising in the History of Medicine. He reviews evidence accrued by fellow chroniclers of medical advances that reveals how we scientists regularly distort the historical record, sometimes for our own egocentric advantage, other times to promote past practitioners to hero status. It’s a salutary tale (or rather, a series of tales) of distortion and frank misdemeanours that challenges more pious view of scientists’ cool objectivity. And we all know it’s true. Waller’s account of the discovery of the isolation of insulin and the demonstration of its efficacy in resolving diabetes is a classic case of Shakespearian dimensions – human ingenuity coupled with pretence and comical folly. We learn that Pasteur may have got the right answers but suppressed results that didn’t fit. As a British diplomat once famously confessed, he had been ‘economic with the truth’. For the rest of us: he cheated.